The Vista Murrieta High School girls basketball team was eliminated from the CIF Open Division playoffs after a heart-wrenching loss to Long Beach Poly on Tuesday night. The Broncos lost the quarterfinal game 58-54 after leading by more than 10 points in the third quarter. Vista Murrieta will still play in the state championship tournament, but will have to wait two weeks until its next game. The Broncos will be competing in the Division I bracket of the tournament. "It’s a tough situation to have to sit around for two weeks without playing," said Vista Murrieta head coach Chris Jones. "Honestly I’m not quite sure … how you wait for two weeks to play and keep yourself fresh, keep yourself motivated and all that. We have to figure out a way to do that." In its loss to Long Beach Poly, Vista Murrieta led throughout the game until the final period. The Broncos were ahead by seven points at halftime and went up by as many as 12 with just under five minutes remaining in the third quarter. 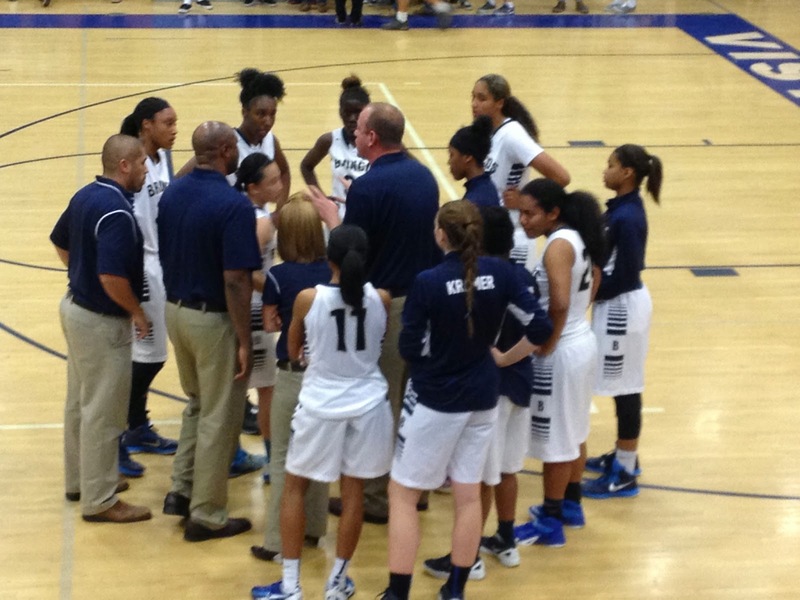 Vista Murrieta was also dominant on defense, stealing and rebounding whenever the opportunities presented themselves. Keeping Vista Murrieta ahead in the game were juniors Brittney Reed and Jaelyn Brown, contributing 21 and 10 points, respectively, in the first three periods. "Brittney was incredible early," said Jones. "She really keys in mentally and does a good job. She held us together when the rest of us weren’t as efficient as what we typically are." However, the game took a turn in the final period as Poly took a slight lead with four minutes remaining in the game, and the Broncos were never able to recover. "I think we were a little bit shaken and didn’t need to be and I think that hurt us a little bit," said Jones. "I think some of our kids wore out a little bit. They played a lot of minutes out there in a very intense, up-tempo game." "We weren’t going out to the 3-point line," said Brown. "They hit a few three’s on us and our offense just couldn’t get in a rhythm." Reed ended the game with 23 points, while Brown finished with 17 points. It is up to the Broncos to now keep their heads in the game as they take two weeks to prepare for the State Championship tournament, where they will be competing with teams from a higher division. "[We need to] keep practicing, getting on the court, still working on what we do, sticking to what we do," said Brown.